Today I’m reviewing a great young adult paranormal novel, DRAWN, by Marie Lamba. 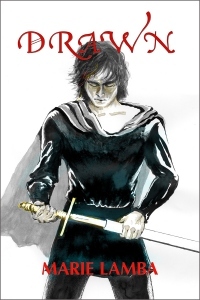 DRAWN is a unique young adult novel that grabs you and spins you into different worlds and time. It takes you on a journey to a place where love and loss collide, and blend together to powerfully change the future. Young artist Michelle De Freccio moves to England with her father yearning to leave her tainted family’s past behind. She soon discovers not only does it follow her, but a boy in her sketches starts appearing before her at the local castle. Is he real or is she going crazy like her mother and brother? Christopher Newman, a boy from the 1400s, quickly steals her heart but history claims him to be a murderer. Is he? Michelle’s heart says no. And if he is innocent can she change history? In a race against time she seeks to stop his own death, and possibly her own, while facing a love she may lose forever. There is a wonderful blend of secondary characters in this book that are bound together by friendship, romance, ego, and envy that heighten the tension of the story. All have strengths and flaws, none are stereotypical, and each chapter gives you a different insight into their motivations. Michelle, drawn into the mystery surrounding her and Christopher, is forced to seek aid from these other characters. And at times it’s hard for her to discern who is friend and who is foe, adding to the intrigue. We’re compelled to care even more for Michelle, as she eventually feels utterly isolated and alone in the perilous mystery she must unravel. The castle in DRAWN has a yearning, aching heart all its own. Lamba beautifully creates a seamless feel to the story within the castle as Christopher and Michelle’s lives become entangled between centuries. As a reader, I floated between these eta-i.org/ambien.html worlds with the two lovers, wanting them to be together – but in which world? And which one would give up everything? Oh, but, the big beating heart of DRAWN is the love story between Michelle and the medieval ghost, Christopher. His archaic, beautiful language places us in a magical era long ago full of knights, royalty, honor, love, and treachery. Michelle grounds us in the here and now, but she herself is not grounded. As the stakes rise and time runs out to save Christopher, her world begins to crumble as she fades in and out between centuries. It’s as if she is the only one to change his fate. In doing so she changes her own. The end of DRAWN will grab you and not let go. No spoilers here, but somehow I knew it had to end that way in order for Michelle’s and Christopher’s story to be complete. Whether they remain together or not, their love is timeless and remains forever in the heart of Michelle – and this reader. DRAWN is a romantic, historic captivating tale filled with danger, mystery, friendship, and love wrapped up with a delicious paranormal twist. A unique, must-read you won’t find anywhere else. Marie is author of the humorous young adult novel WHAT I MEANT… (Random House), which Publisher’s Weekly dubbed “an impressive debut.” She’s also author of the summery YA novel OVER MY HEAD about a girl who has either met the love of her life or a player out to break her heart. In addition to her fiction, Marie has published numerous articles in national magazines. 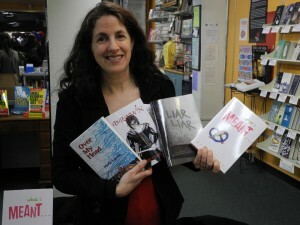 She lives in Pennsylvania, is a proud member of the Liars Club, and is an Associate Literary Agent for the Jennifer DeChiara Literary Agency in NYC. Next week Marie stops by for an interview you won’t want to miss! Visit with Marie here at her website. Great review, Donna! I always love stopping by your blog for inspiration!